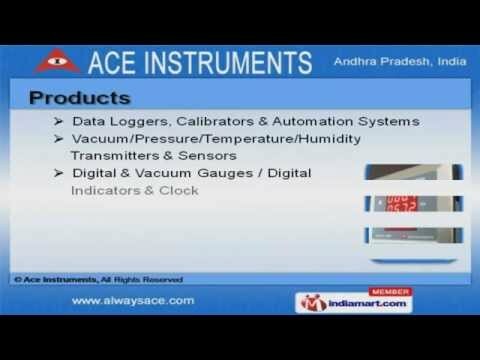 [http://] Welcome to Ace InstrumentsManufacturer & Supplier of Process Control EquipmentIncepted in the year 2003 at Hyderabad, we are an ISO 9001:2008 certified company. Rigorous quality inspection & Numerous modes of payment make us unique in theindustry. Cilpia & Dr. Reddys Labs are some of our esteemed clients and we are backed withlarge production capacity & customized solution. We offer a diverse range of Data Loggers, Humidity Transmitters, Clean RoomInstruments & Automation Systems. Data Loggers, Calibrators & Automation Systems offered by us are best in the industry. Our Vacuum, Pressure, Temperature, Humidity Transmitters & Sensors are widelyappreciated in the market. We offer Digital & Vacuum Gauges, Digital Indicators & Clocks that are extremelyreliable. We also provide Clean Room Instruments that are well known for their impeccableperformance. Along with that we offer Laboratory, Hatchery & Flameproof Instruments that are a classapart.